I’m not a big fan of November backpacking. Though somehow that hasn’t hindered me in the last years to plan week-long backpacking trips in what I find the worst time of the year. And to top things off, I always manage to convince other people to join me on the trips. These time my companions came from as far away as Japan and the United States of America, to experience what Finland (does not) have to offer in November. An Ultralight Summit trip report. Well, you catch my drift. Benjamin, Jotaro, Takashi and Hideyuki arrived in early November in Helsinki, and on a Monday morning at 7:12 o’clock we sat in a train to Joensuu. Four and half hours in a train with free Wifi, electric outlets and a decent Board Restaurant can still be long, and it was nice to stretch the legs shortly in Joensuu before getting a ride from a good friend to Koli. And then we are there. Nearly at the top of this 400 something metre high hill, there’s a sweet looking hotel (although in cold wind probably any hotel looks sweet & inviting) and a visitor centre - which, with our luck, was closed. Good timing, there. 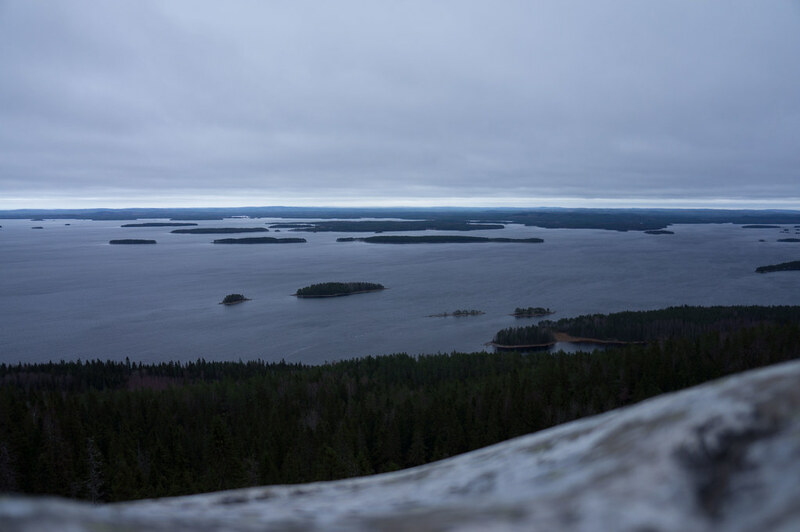 We tried to reach Takashi and Hideyuki who traveled here already a few days earlier, but as we couldn’t reach them we set off towards Ukko-Koli, Akka-Koli and Paha-Koli, the three peaks from where one has very nice views over the lake towards Russia. 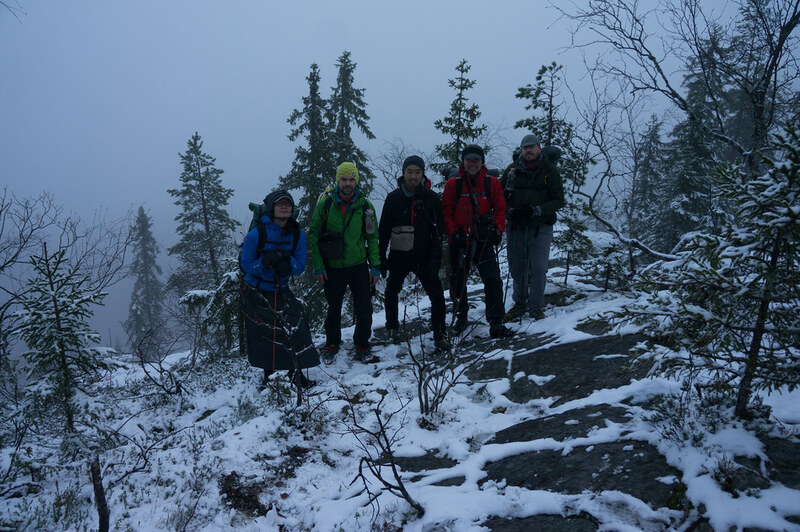 It’s as we stand on the third peak that I get a message from Takashi - they’re at the hotel now, where shall we meet? Ten minutes later - Takashi and Hideyuki ran The OMM in Wales before they came to Finland - we meet, and agree to get together at the first camp spot later. While Ben, Jotaro and me set off, the weather is changing from cloudy and windy to cloudy, windy and drizzly with increasing Darkness™. We descent from the Koli peaks, past pastures of old, over soft grass fields, along a bit of road until we ascent and head for the Kota at Ryläys. It’s pitch black and snowing as we hike via duckboards over a hanging bog towards the Kota, and are quite relieved as we see the humble abode for the night. We saw and chop wood and the fire is just going as Hideyuki & Takashi arrive. 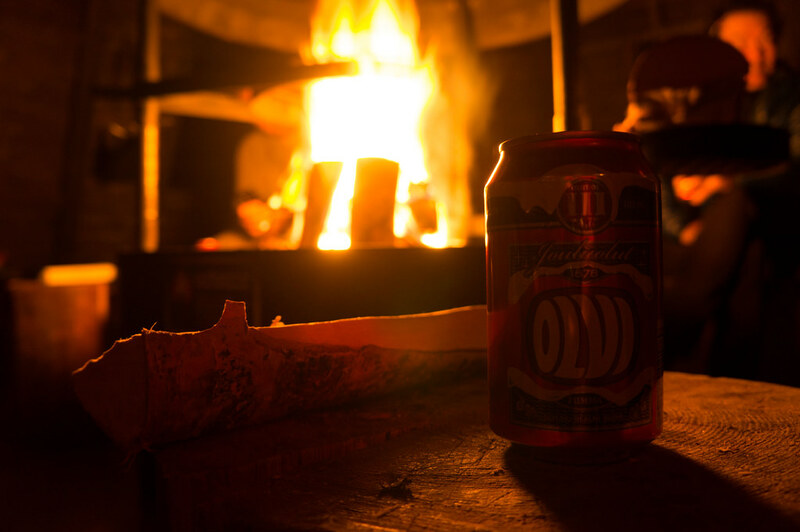 We welcome them to our massive shelter for the night, put on a couple more logs, and I finally can get the heavy load I carried till here out: To celebrate this first night I brought a Olvi Joulu Olut for everyone along - well over 1,6 kg! I reckon this makes the first night sort of a Brovernighter™. Anyway. Fire. Shelter. Snow. A new bivy. After eating well I decide to take the new bivy outside into the snow and sleep there - it’s the perfect, safe opportunity to do so. I slide into the red bivy, snow falling strongly around me, zip it almost closed, change socks, and fall asleep. Three hours later I wake up, and decide that it was enough - the top of my sleeping bag was a bit moist, and I rather have a completely dry sleeping bag, so I pack the whole shebang up, sneak inside, put another log on the fire so I see something, and fall asleep next to my fellow lightweight backpacking friends. The next morning we’re in winter wonderland. Everything is white - the trail, the kota, the trees, the ground. We smile. Light the fire. Eat breakfast. 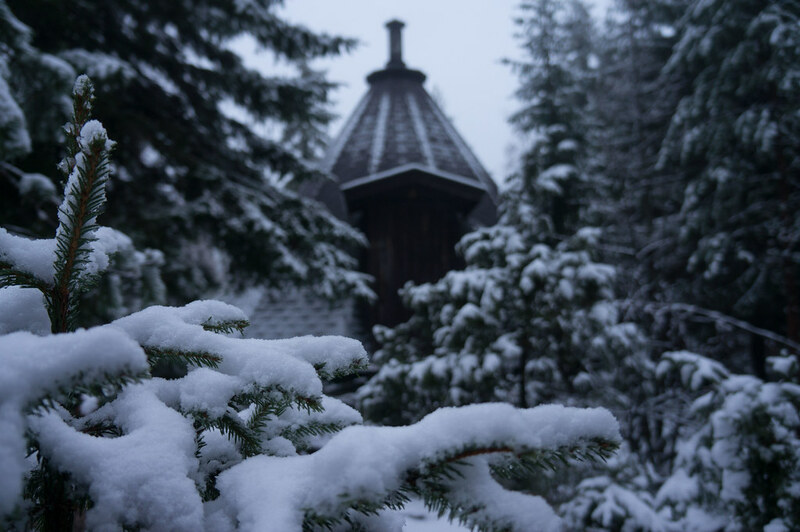 Enjoy the silence of the snow, the mist in the tree tops, we wander around the cozy Kota with its warm fire inside. 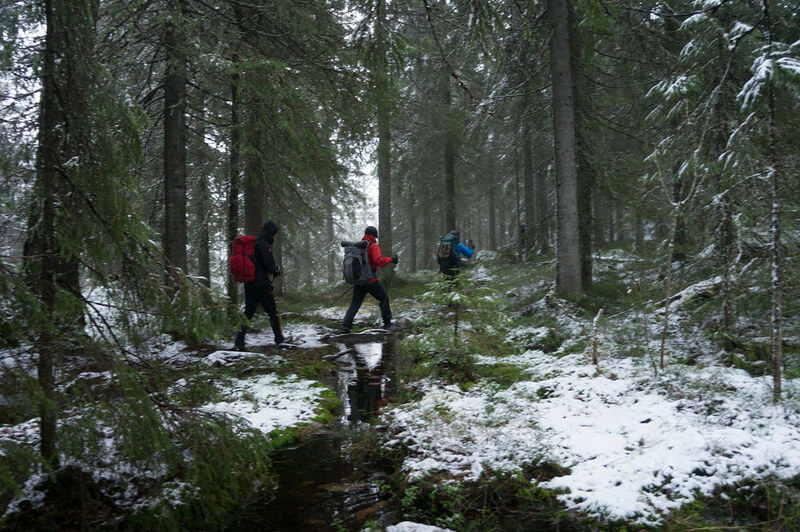 But even the cosiest Kotas can not hold back eager backpackers, and so a while later five hikers emerge from the wooden structure, around them the snow melting & dripping from trees. The thermometer has slipped just a degree or two above Zero, enough to make the snow starting to melt and dribble on us. We ascent the hill we’re on, upwards to the look-out tower with the broken ladder. It’s so misty that we wouldn’t have seen further than 50 m from up there either way, and so we walk a bit further, have a group photo at the “Waterfall of Rocks” (hidden in the mist) and continue. The trail winds along the top of a ridge, goes a bit down into the forests where we cross fast flowing small streams by jumping from tree roots to tree roots, and then ascents again a few dozen meters, back to hard, wet granite under our trail runners. Then comes the moment that Hideyuki & Takashi need to turn back. As they came before us, they will leave us already today. I show them on the map that it might be faster to come with us another few kilometres to one of the forest roads, which should be quicker to hike back to the Visitor Centre. But the two, quite rightly in hindsight, decide to hike the same way back we just came. They just finished The OMM, so this certainly isn’t a problem for them. As we say our good byes, it always feels a bit sad to say bye to people whose company you enjoy, but that’s life. We’ll hike again together this year. 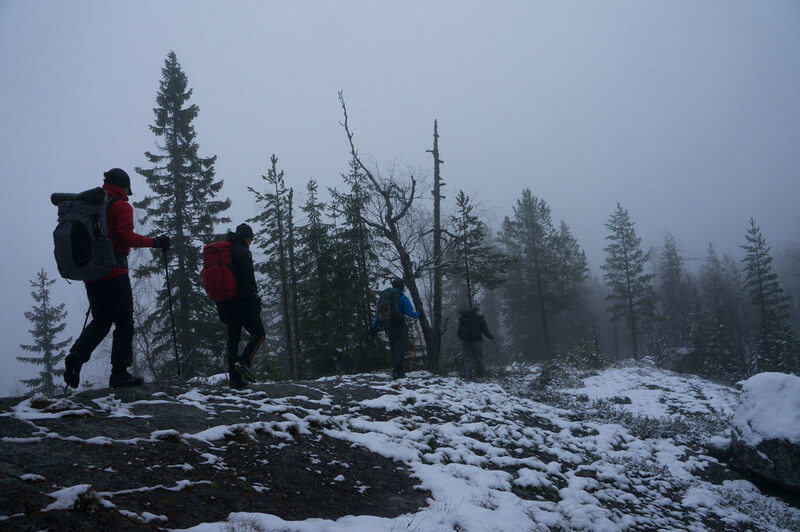 Ben, Jotaro and me carry on, the mist and dripping snow our constant companion while we walk high. As we descend, the snow is largely gone, we can see further, and the trail gets wider. We hike for a while on a forest road, but also here we encounter no one. It’s far past noon as the three of us arrive at a laavu - or the ashen remains of it, all that is left standing a oven in front of the burnt down structure. The wind is blowing strongly from the lake and the fire doesn’t really want to bring our pots with water to a boil, even more wood and a windshield do little to improve the situation. After what seems like forever warm drinks & soups are hungrily consumed, jokes are made, pots cleaned, the fire is put out, and we walk back to the adventure centre. That’s the desolated adventure centre. A wet hammock swings in the wind, the camping ground - pitching your tent here costs 10€ - is flooded, and the small cabins are all locked. We walk down to the strait, where a rope between two pulleys, connected to a raft, is drifting in the middle of it. We pull the raft to our side of the strait, board it, and while I take action photos of the crossing Jotaro and Ben bring us safely to the other side. There we stand, laughing about this interesting way to cross a water body, take a few more photos, and then head onwards. The path on the island goes very closely along the shore, and often is either flooded, muddy, or both. At a fire place in the centre of the isle we look north from the shore, seeing the mountains we stood on the day before, grey clouds and mist hanging not far above their summits. Water drops from leaf-less twigs paint circles as they hit the lake. We snap photos, have a kuksa of lake water, and continue. 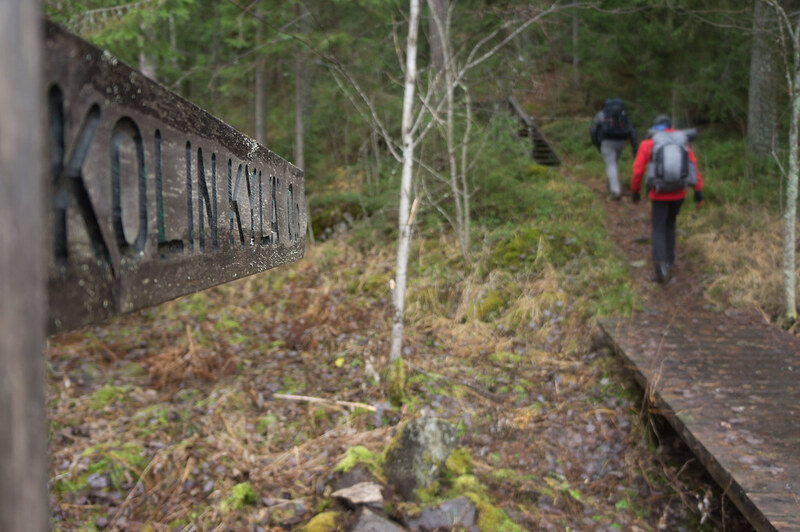 The other strait is crossed via a lovely wooden bridge, and we walk along signs telling us that we should stay on the trail. Obvious the summer cottage owners right next to the path have had their fair share of hikers pick their berries. We hike on as dusk is setting in. It quickly gets dark in the forest, and every time we cross a glade it gets lighter again, the eyes try to adjust, but we’re so quickly in the dark of the trees again, they don’t have time. 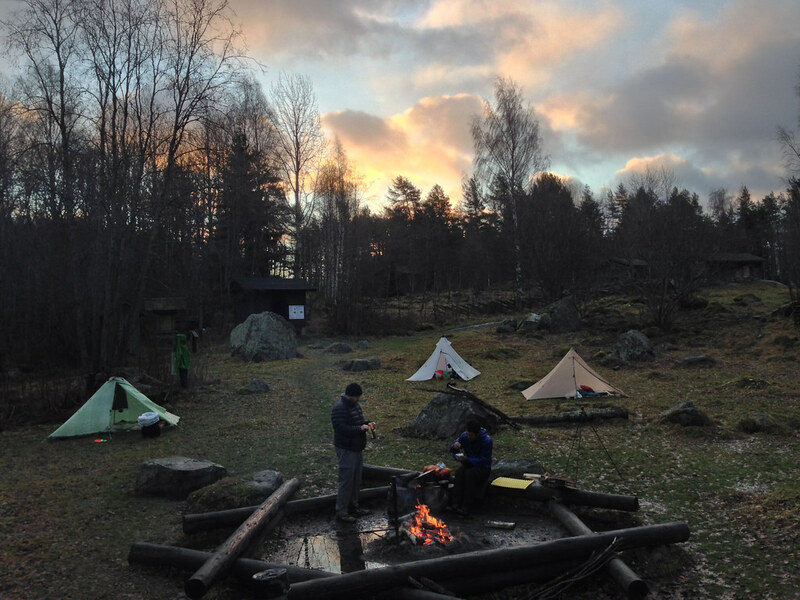 As we reach the final clearing at Lakkala, it is the camping place we will stay at this night. An old crofters lodge, with various stables, fields and little laavus for the sheep who graze here in the summer is where we will pitch our pyramids this night. Once we found dry spots, that is. The field which is designated as a camping place for pitching tarps and tents is ABOUT 75% flooded. Nevertheless, Ben, Jotaro and me find each a spot where our pyramids go up, with enough dry space to unroll our sleeping pads, bivies and quilts. Then the task of making a fire begins. I carried a first load of split logs to the flooded fire circle, and start the task of making feather sticks and building the fire, while Ben & Jotaro carry each a couple of arms full of wood to me. In this rain & wind, we’ll need fuel. Armed with two hands of dry birch bark and half a dozen of feather sticks the fire is roaring in no time. We keep it going strong, the wind blowing in gusts from the lake while the rain keeps falling at a steady pace. Dressed in eVent and Gore-Tex we sit around the fire, split logs as little footstools to keep our soaked trailrunners out of the puddles around the fire. Despite the miserable weather we sit there, eat, drink and laugh. 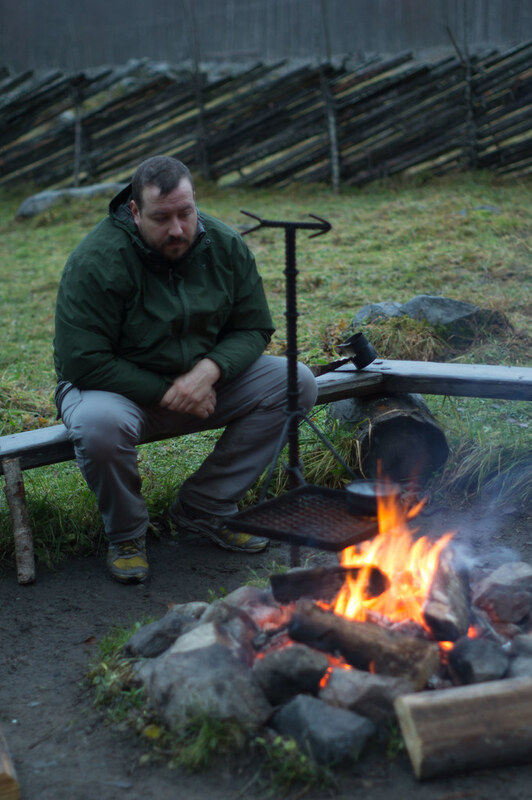 We put more logs on the fire, trying to find the optimal spot for out titanium pots to boil one more cup of water, and then at 19 o’clock head each to our shelters. In the glow of my headlamp I read a couple more chapters of Terry Pratchett’s latest novel, before I switch the Nao off and lay down. The wind howls over our little shelters, and pulls at the cuben and dyneema cords. But everything holds, and in the next morning I awake as I hear Jotaro’s camera shutter opens and closes. It’s still dark, it’s still wet, and there’s still wind going. 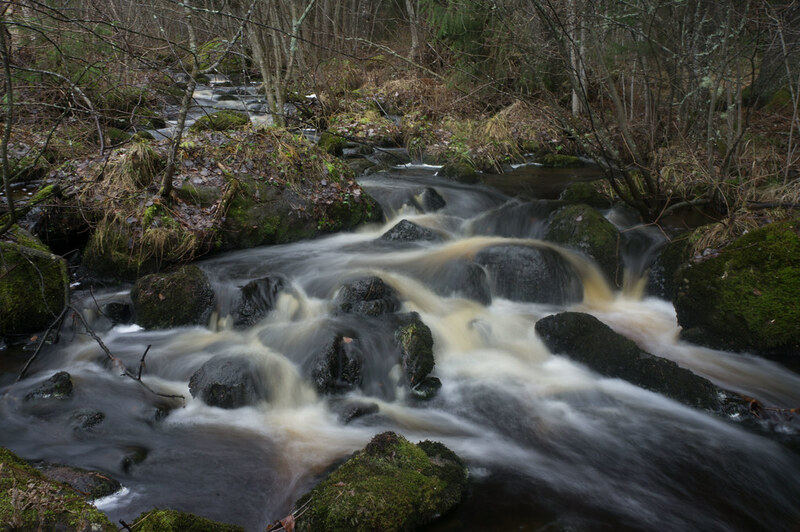 Eventually I slip out of my warm down cocoon, into wet socks and shoes which are quickly warmed up by running a few hundred meters on the trails. A fire is started again in the middle of that puddle while grey clouds race over the sky, giving glimpses of blue. We’re so absorbed with looking at the fire and eating that we are surprised as the sun sends a few rays through the forest in our back. We pack up what is dry, though our shelters are not in that category. 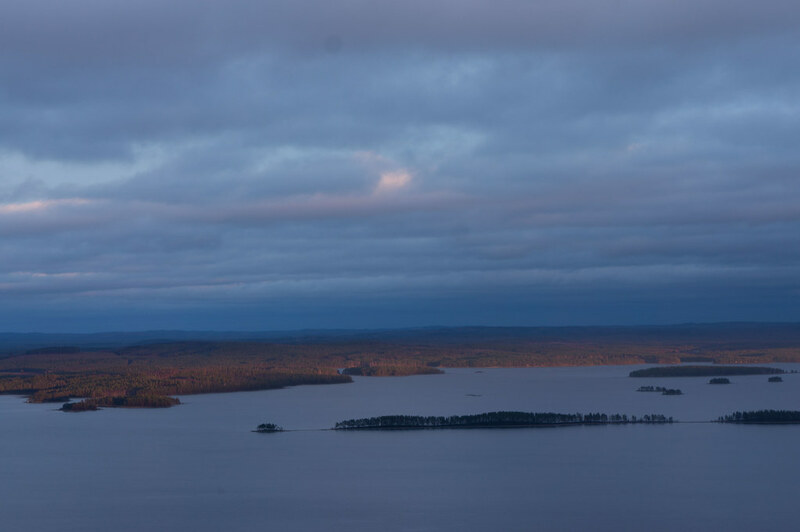 We’ll return via another ridge to Ukko-Koli today and a campground close to the town, and as we shoulder the packs, now wonderfully light as less and less food is carried, the sun illuminates the hills on the opposite shore. The trail is nice today, it changes between hard granite and softly-cushioned pine needles with a few duck boards in between. 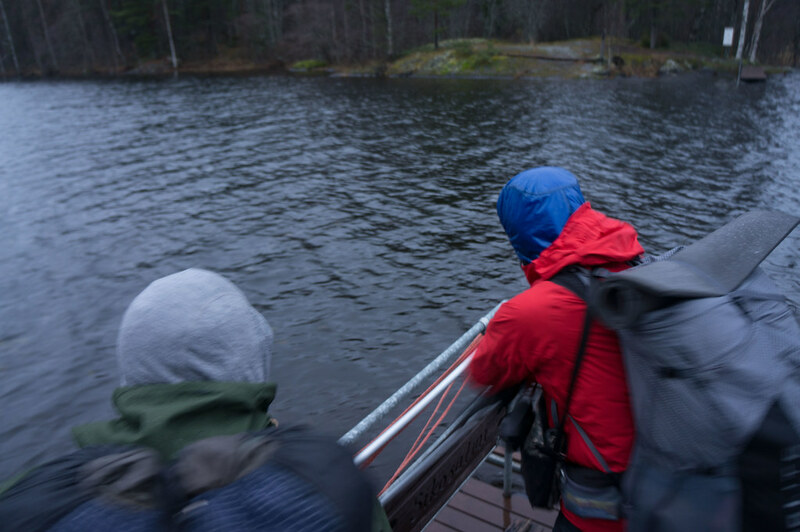 We get glimpses from the top to the surrounding lakes, forests and hills, but are blasted by a relentlessly cold wind and I’m happy to wear a fleece under my softshell. 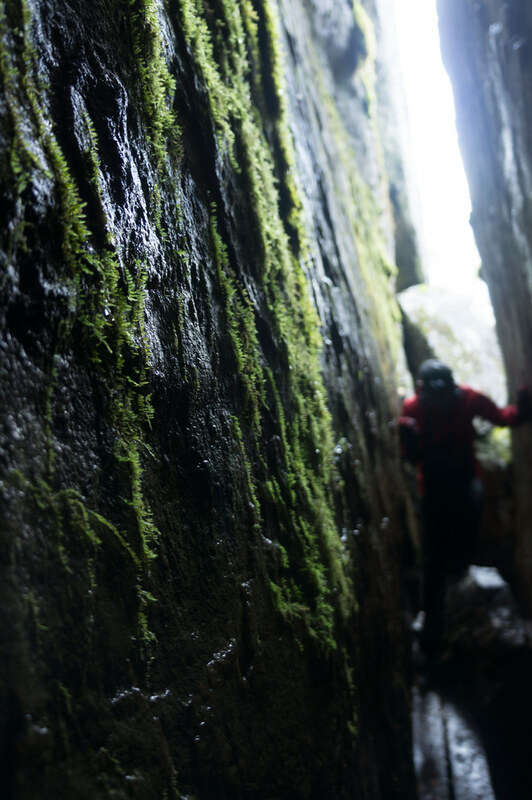 It doesn’t take us long to come to a crossroad, where we stash the packs behind a tree and hike the kilometre and a bit to the Devil’s Church, a 33 m deep cave in a Z form. Without packs the pace is fast as we hike steadily down. We cross a wide forest road and descent wooden stairs to the cave, and climb in. It is moist, green moss grows on the walls. 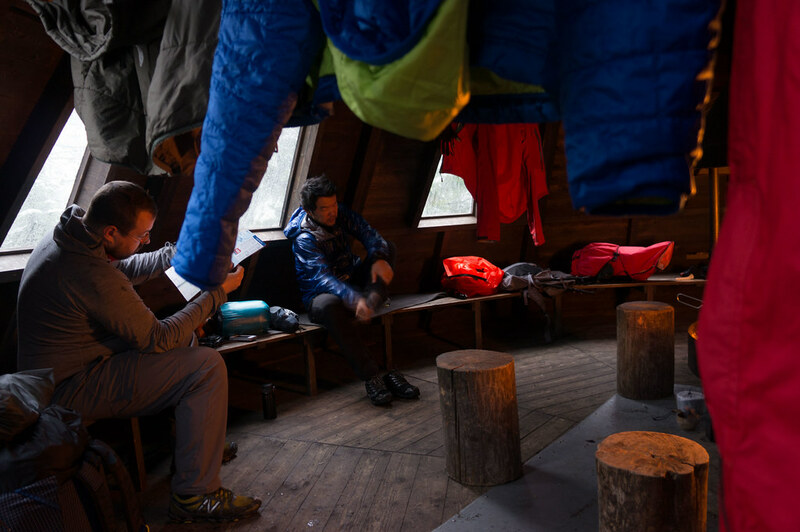 We spend a little time in there before we head back, all the way up to our rucksacks. On the next stretch it feels like we spook up Western Capercaillies with every third step. These large birds of the grouse family are in such abundance here that thoughts of a Capercaillie hunt cross my mind. But without a bow & arrows, this idea stay in the realm of fantasy, while the realities are boiling water for soups-in-a-cup with bread and snacks. After our last lunch on the trip, at a fire pit which offered so wet wood that we were well smoked afterwards, we continue for a bit on a forest road. As we come to a junction, where the trail takes a turn into the forest and heads uphill, Jotaro & Ben tell me they’d prefer to continue on the road to the campground. It’s easy enough, so I leave the two and head up the ridge to Mäkrä hill. I run parts of the trail, happy to go at my own speed, and also in a hurry because the Golden Hour is about to begin any moment now, and I’d rather see it from the top than from the middle. My speed pays off, and I see how the sun sends its last rays towards Russia, while it sinks down behind Sweden, Norway and the lands beyond. The forest opposite of the lake is illuminated by the light, a pulsating movement as clouds whisk by the sun, that descends further and further. I walk along the ridge, more Western Capercaillies taking flight as I approach, and as the western horizons is adorned with an orange band, I take a last look East, then West, and descend. 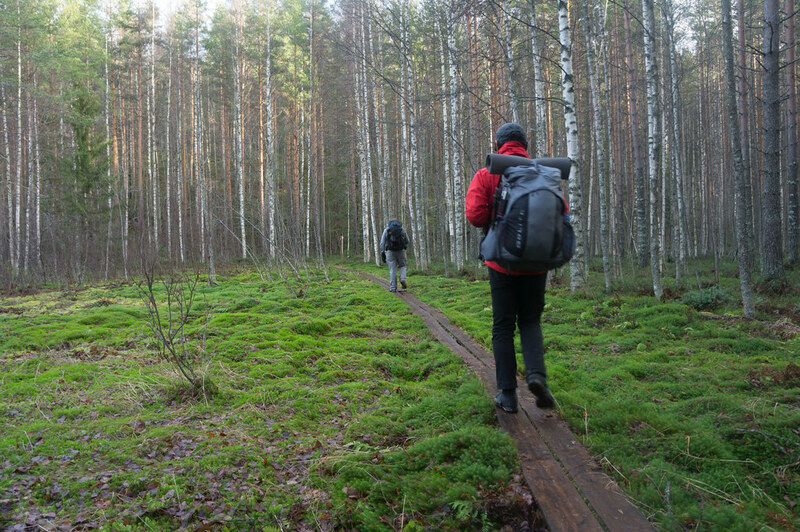 I emerge out of the forest at the Mäkränaho clearing, and choose the wide trail back towards the Visitor Centre. Along the trail I pull the Petzl Nao once again out of my ZPacks Multipack as darkness engulfs me. 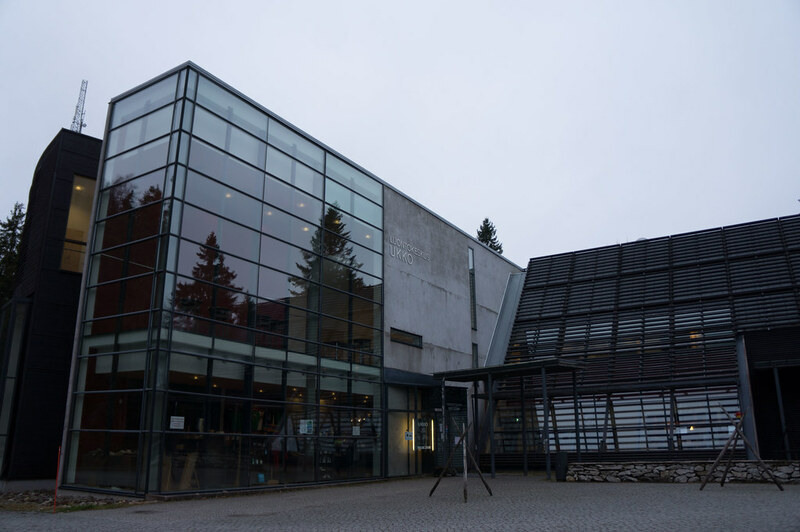 It does not take long for me to reach the Parking Lot of the Visitor Centre, and I run the stairs up to the Hotel & Visitor Centre, where the trail to Turula continues. Again I hike down a wide, well-maintained trail and as I arrive at the campsite Ben & Jotaro have already pitched their shelters. We gather wood once more from the close by wood-shed, fully-loaded with split logs and generous amounts of birch bark, and soon sit again, with our wet shoes propped up on a log close by the fire, around it. Water we get from a nearby well at a farm-house, but only on the second try we locate the right well - the first one we filled our Platypus bottles up from had E.coli bacteria, as the owner of the house informed us. We sit long around the fire, and are a bit startled as a trailrunner runs past us and our shelters, the beam of his headlamp jumping along the field and roads until it disappears. Before heading to sleep I give my NeoAir XLite Sleeping Pad a few additional puffs, before I slip into the Therm-A-Rest Antares sleeping bag. The wind gives a few kind tugs at the UltaMid, and a few raindrops hit the cuben, though overall it is a silent night. The next morning Ben and Jotaro are well up before me, and I lay long in my sleeping bag. The sound of fire, which Ben started, finally rouses me and I join the two outside. 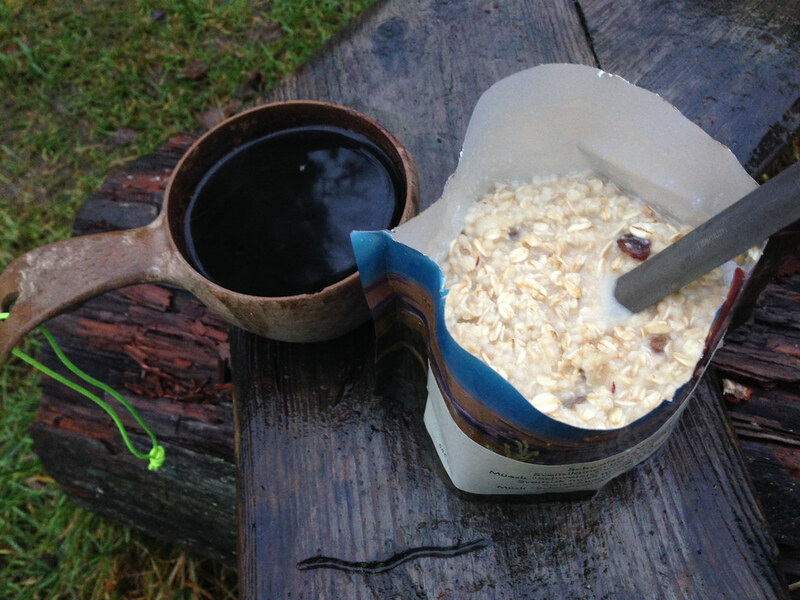 Starbucks Via and a Trek’n Eat Swiss Müsli are for breakfast, and especially the latter is superb. I’ve tried many ready-made trekking müslis, and non were good which is why I usually made my own, but this one was so tasty that it’s a serious alternative to MYOM-üsli. 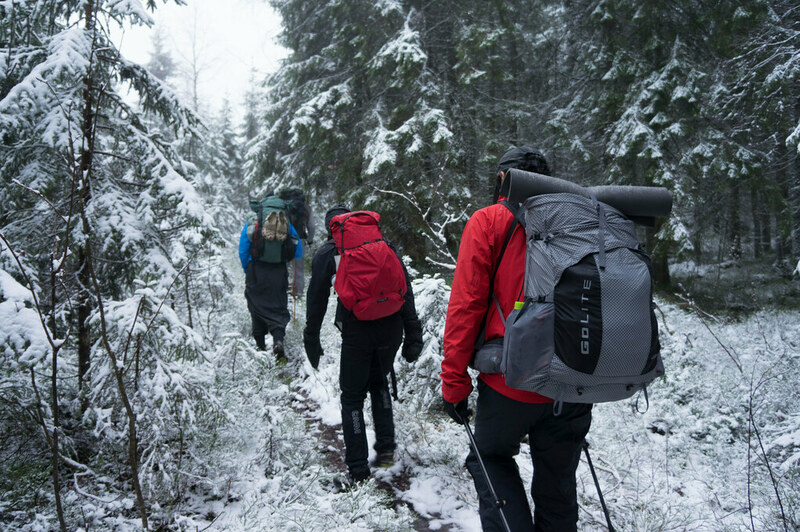 Sleep systems and gear are again packed, shelters shaken to make them a bit less wet, and we set oFf towards the Koli Village. I arranged for a Taxi to pick us up there at 11, but the two kilometres from the campsite to the village, along old Farm buildings on what is in winter a skiing track, does not take us long. We have so much time till the Taxi comes that we sit down in the Café and order salty crepes and coffee, skim through Finland’s worst outdoor magazine, and enjoy being indoors in the warmth after all the snow, rain & wind outside. Back in Joensuu, civilisation has us back. We visit a lunch place and supermarkets, have coffees and wait till the train takes us back to Helsinki, where Ben & me will meet Joni for an overnighter in Nuuksio. But that might be another story. More photos on Flickr. The UL Summit 2014 will be in Nippon. Watch this space and Facebook if you’d like to join.